Not only are the ‘standard’ fence too short to offer full support for longer lengths but, with a good inch or so either side of the blade, you rarely get a clean cut and any small offcuts ‘ping’ off somewhere behind the saw! My new fence is made from MDF and fixed directly to the existing one. 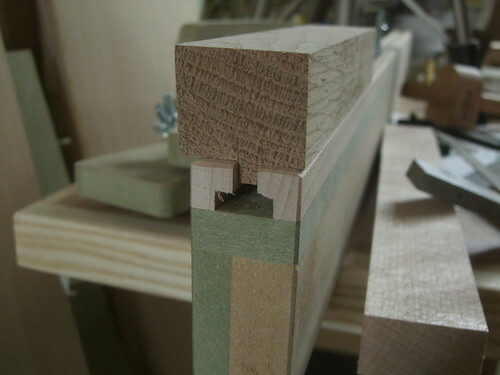 I laminated two layers (18mm standard and 13mm MR – because I had some spare) in the hope that this will increase its rigidity and prevent the unsupported end from flexing or bowing. Ideally, I think it’s best to cut this from one continuous length, rather than to form one separate length for each side of the blade. But, I didn’t have enough spare material to do that, here. If you could afford plywood though, it would undoubtedly be a better choice still. Along with the new fence, as I mentioned briefly at the end of my last post; I also wanted to fit a couple of ‘shop-made flip-stops, rather than the simplistic blocks of wood I had on the previous model. 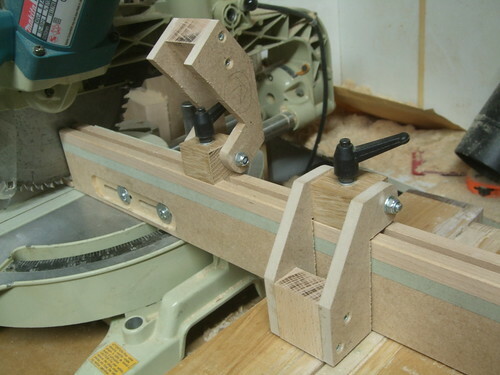 Steve Maskery came up with an excellent design in volume three [The Ultimate Table Saw Tenon Jig] of his Workshop Essentials DVD series. This can be made from workshop scraps and, as I couldn’t think of any way to improve it as such, I’ve only modified the dimensions slightly but, otherwise, I’ve simply copied his design. A block of wood slides along the top of the track, with a tongue formed on the underside for location [see above right]. Through this, there’ll be a vertical hole for the coach bolt and another longitudinal one (which must not foul the other!!) 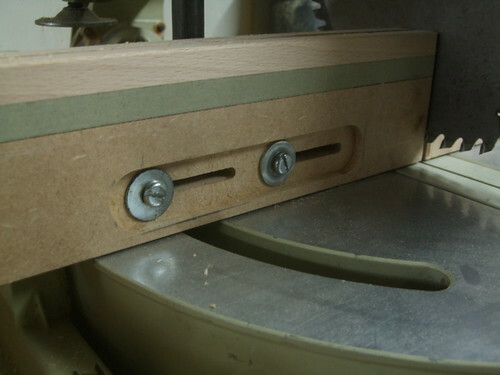 for a length of studding that allows the reference stop to pivot. I chose to make two (one for each end) at the same time though, the beauty of these is that you could easily make several more and leave them on your fence at all times; just flip them up and out of the way when not required! 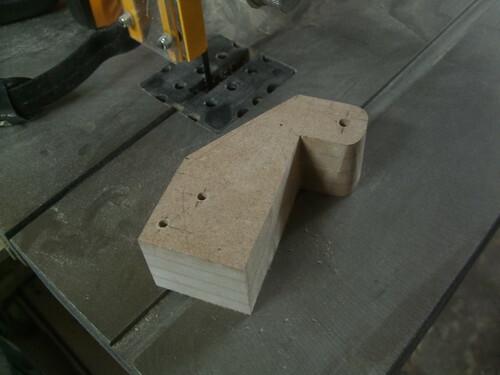 😉 When cutting the components for the sides, I held four scraps together with double-sided tape and roughed them out on the bandsaw. In position, this fence is fixed directly to the existing one with machine screws, washers and lock-nuts on the reverse. One thing I did discover after fitting was that the standard fence on this Makita saw was very slightly ‘hollow’ (concave) in the centre around the saw blade. This didn’t surprise me much as it was a comment I had previously picked up while searching for reviews of this model. With a little bit of masking tape behind though, I was able to shim it out to as-near-as-level. 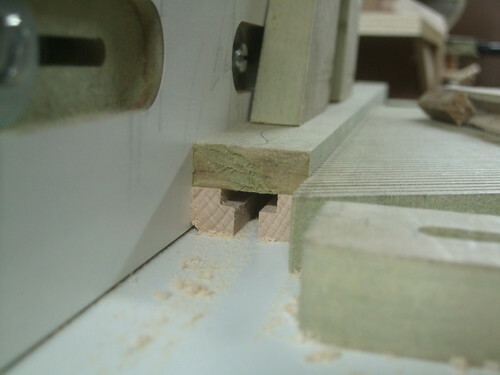 Both slots allow the fence to slide clear of the angled blade when I want to cut mitres up 45°. 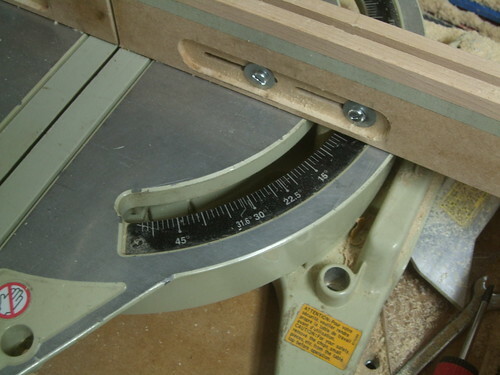 Also, if I replace this blade with one of a thinner kerf, I can rest the zero-clearance effect by closing the gap and cutting through both parts. One oversight on my part – adding such a substantial sub-fence obscures my view of the mitre-angle scale! This isn’t a huge issue though, as I would generally rely on a sliding bevel or other device first and foremost, anyway. This week, I’ve had a chance to use the new fence and stops on several occasions and I truly am delighted with how well this works and how easy is to square up one end, flip the stop down, cut to length, swing the stop back up and cut the next board. 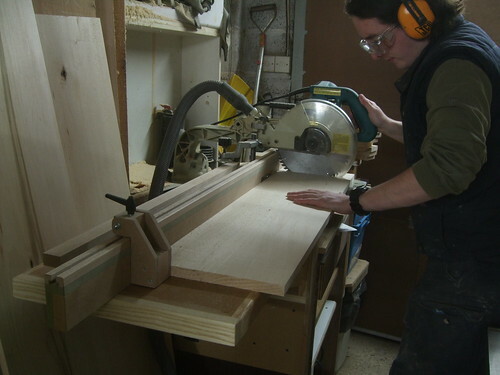 At the moment, I’m pretty busy making some shelving units/cabinets for someone in Bristol. This is likely to become a regular series of work though, I cannot give away any details of the designs right now… We’re using American lime as these units will eventually be painted – best part is, I’m not doing that part!! 😀 This is the first time that I’ve used this species and its working qualities remind me of tulipwood [not the Brazilian stuff! ], which is generally regarded as the next best thing after pine. It’s also that much nicer to work with, without all the resin and sap! 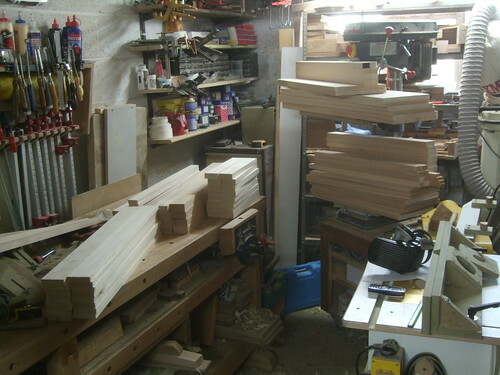 All the wood was ordered as PAR (planed all around) and delivered in long lengths, thanks to Robbins Timber – you should have seen the state of my workshop on Monday morning though, having to house boards in lengths from 3.6m to 6m while I cut them up!! They’ve done a pretty good job and it’s certainly saved me a lot of time. 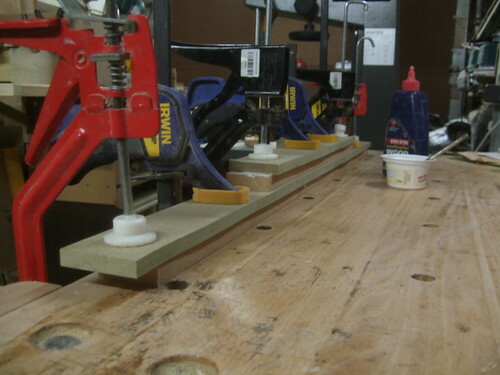 Anyway, the flip-stops really came in to their own here; I couldn’t have gotten through this initial stage so quickly without them (…yet another situation where at table saw with sliding table would’ve proved more of a hindrance than a hand!!). I’ve still got to work on the extending part of this fence, which I hope to get around to within the next ten-days.